For the second time in three UFC title fights, Chael Sonnen (pictured) came within seconds of shocking the world en route to capturing a shiny belt. Reigning light heavyweight king Jon Jones was an astronomical 10-to-1 favorite to dispose of Sonnen at UFC 159, but believe it or not, Uncle Chael was just 27 ticks away from serving up an upset special and taking Jones’ crown on Saturday night. Sure, Sonnen wouldn’t have notched the biggest win of his controversial career by conventional means, but it wasn’t his fault “Bones” broke his big toe at some point during the first round. If referee Keith Peterson didn’t bring the mauling to a stop at 4:33 in the opening stanza, Jones would have headed back to his corner and realized his toe was pointing east. Can you imagine Sonnen walking the mean street of West Linn, Oregon with UFC gold around his waist? Would it have been safe to roam that “violent neighborhood” with that type of bling? Of course it would have, Sonnen’s a gangster. Speaking of gangster, despite not knowing his fractured bone had pierced through the skin until conducting his post-fight interview, Jones claims he would have continued fighting and not accepted the technical knockout loss. Actually, Jon. The referee and cageside physician wouldn’t have permitted you to proceed with a mangled toe. It is a safety precaution UFC president Dana White was quick to point out. “He wouldn’t have been able to go back out there because the doctor would have stopped the fight,” White interjected. “His bone was sticking out of his toe. And just like that, Sonnen’s championship dreams were once again crushed in a matter of seconds. Middleweight champ Anderson Silva did the honors the first time around when he tapped out Sonnen with just 110 seconds remaining in their bout. 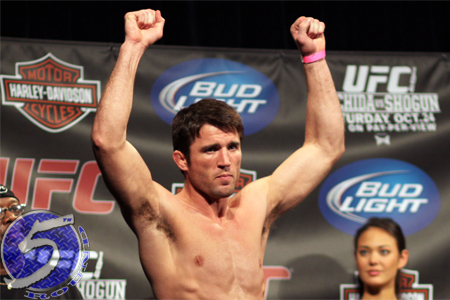 Sonnen had dominated “The Spider” for nearly five complete rounds prior to the Hail Mary submission.